This week marks the start of December, and for all you Christmas connoisseurs, that means only one thing! It’s time to dust off the tinsel, shine those baubles, and start decorating the Christmas tree! If your festive foliage is in need of a style update, there are plenty of looks and trends to choose from, and we’ve handpicked just a few of our favourites. Read on to find out how to fill your home with festive cheer, while keeping in vogue this holiday season. 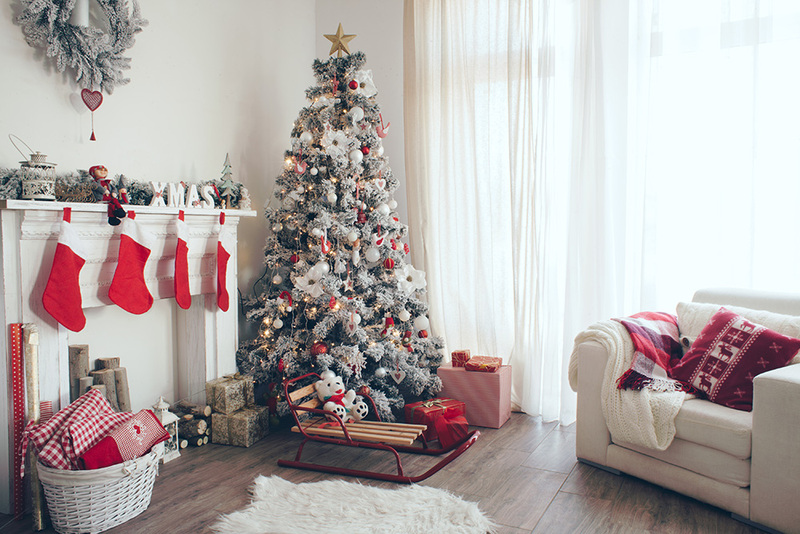 Fairy lights and tinsel can take a backseat this year; instead, why not inject a little merriment into your tree’s overall look, by adding decorations that are more than just aesthetically pleasing? We love these gin-filled baubles from Pickering’s in Edinburgh; fun, colourful and different, they’ll be a real crowd pleaser come December 25th. 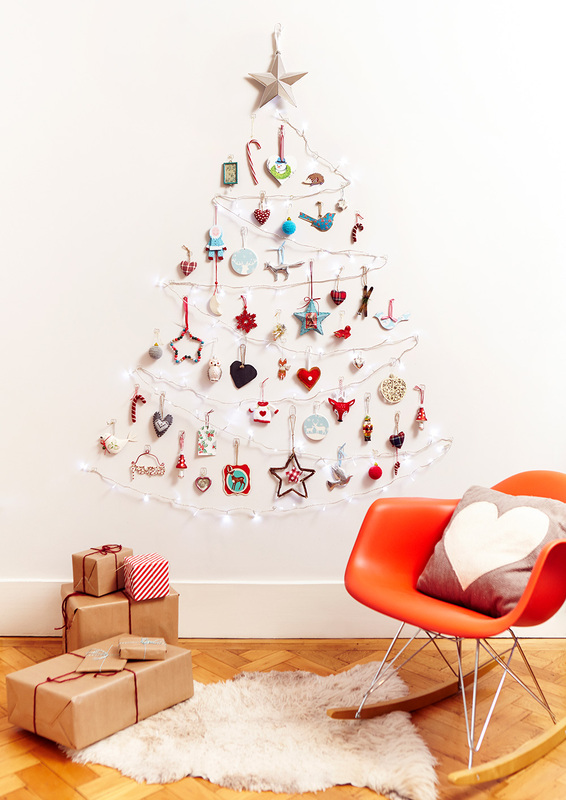 Go naked this Christmas by stripping back your tree entirely! Contemporary, minimalist and sophisticated, this is a look that marries perfectly with monochrome colours and arty spaces. Check out this setup from Houseology – with just a dusting of white and some discreet lighting, the pared-back trend makes a serious style statement for anyone with a passion for cool, wintry tones. You can take this less-is-more approach one step further by doing away with the tree altogether. Adorning your walls with lighting and decorations in the style of a picture-perfect festive fir will look stunning as part of a feature wall, or incorporated into the rest of your home’s overall interior style. For a little inspiration, check out these clever designs from 3M, and replace those pesky pine needles with something clean and beautiful. Just because it’s 2017, there’s still plenty of room in our hearts for more traditional tree options. Classic, timeless and familiar, the more ‘old-fashioned’ feel never goes out of style; which isn’t to say it needs to be dated or out of touch, of course. Take this gorgeous ensemble from Sainsbury’s, whose muted colours and simple accessories still make a huge impact, and which we’re utterly in love with. Continuing the conventional theme, handmade toys, crafts and decorations always hit the spot. 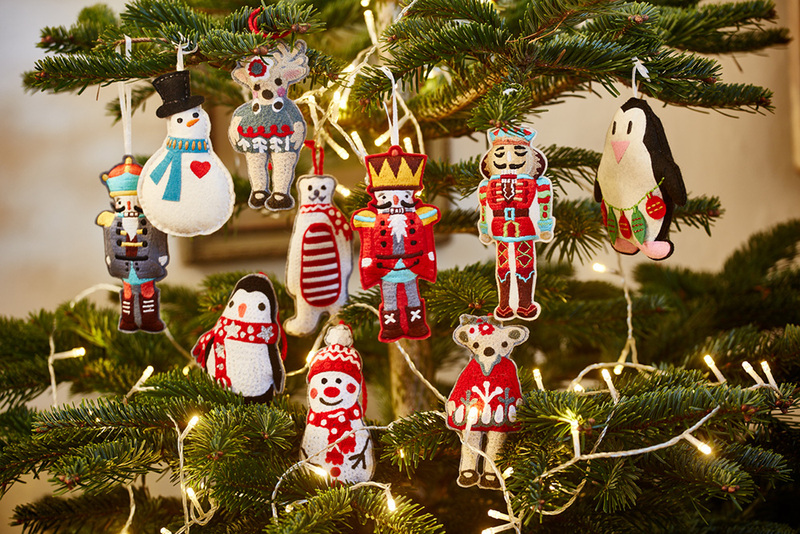 There’s something wonderfully nostalgic about seeing a knitted snowman, reindeer, penguin or nutcracker hanging from the tree, and Pignut have captured that romance perfectly with their country-inspired lifestyle ornaments. Check out their range for a trip down memory lane! If you want to really push the boat out this year, there’s no reason why you can’t let loose and create something completely unique. Forget the greens, reds and golds of old; instead, inject your home with bright colours, glorious pastels and funky designs that will surprise and delight. With its pops of pink and eye-candy appeal, we’re head over heels with this dazzling dressing from Amara. There’s nothing like a smattering of snow to get you well and truly in the seasonal spirit – which is why white-capped trees are as popular as ever. It can be a tricky one to get right, but with the right colour combinations and accessory choices, you’ll be well on you way to enjoying a Yuletide ‘just like the one you used to know’. Head to Haskins Garden Centre in Crawley for inspiring ideas like this one! Big, original and quirky pieces might be the way to go for those who want to turn heads and catch eyes for their 2017 celebrations. Whether they’re hanging from the tree, tucked underneath or littered around the edge, ornaments like these ones from Rockett St George will perfectly capture your tastes, personality and style. You can mix and match a variety of options to create something with a real ‘wow’ factor.